November 2: Hammerspace Community Workshop and Makerspace - Open House Night For New Visitors. Come tour the workshop & meet fellow makers. November 2: KC Roundtable - KC Roundtable Breakfast. For 20-30 something entrepreneurs. November 14 | 5:30 p.m.
Join SMCKC in the middle dining room at Hopcat on Tuesday, November 14th from 5:30pm - 7:00pm. Your $10 registration comes with 2 drink &/or food tickets. Each is valid for one local 30 beer or one order of Crack Fries. MONICA TIFFANY, CREATIVE DIRECTOR/PRINCIPAL, Kerrigan & Co.
Monica served as VP of Marketing and Communications for the Association of Fundraising Professionals — Mid-America Chapter. She currently serves as Marketing Chair on the CASA of Jackson County board. As a professional copywriter, she speaks to both local and national audiences about copywriting, messaging and creative strategy. Prior to joining M&C, Monica spent five years in nonprofit association management. Expo is a framework that handles many of the challenges involved in getting a new react native project off the ground and out to your test users. In this talk we will show you how to get a React Native app up and running on your phone in minutes, without any previous React Native experience. We'll cover why you might want to use Expo, when you might not want to use Expo and our most loved features. Download the Expo app from the App/Play Store before the presentation and you'll be able to load the app onto your phone as well during the presentation. Chris Walter and Scotty Moon are application developers at Crema, a full stack product agency that is currently developing 4 React Native apps, two that use Expo and two do not. Have you ever wondered what it would take to create a simple game, and write it with ASP.NET MVC? While writing that application, have you ever realized, "WOW !! There're a lot of moving parts to this ?!?!??!!" ? While teaching students in his ASP.NET web development class, Ray demonstrated the *original* CONSOLE based hangman game, and then demonstrated transforming and writing the equivalent game in ASP.NET MVC. -- what logic is in each of the previous "steps"
-- ** THEN ** - incorporate WEB API as a "back end service"
Ray has been in the IT industry for 20 years. He has functioned as a software analyst, developer, project manager and software architect in the transportation arena; mutual fund financial services arena; health provider and insurance arena; mechanical engineering arena; video, voice and data cable provider arena; and most recently, the IT Benchmarking arena and manufacturing arena. Currently Ray teaches Python / C++ / Java / ASP.NET / C# at a local community college, owns his own consulting company and does work for various consulting companies around the Kansas City area. • Afterwards anyone who is interested is invited to join us at Austin's Bar and Grill located at 2103 E 151st St, Olathe, KS 66062 for an informal social. Bring your laptop so you can get set up to get started on designing your first 3D creation. FYI: There are two ONI 3D printer set up in the HammerSpace 'Big Room' available to members of HammerSpace. Every wanderer of the Wastes needs a trusty tool to help them with Radroaches, Molerats, and even the occasional Raider or Super Mutant. 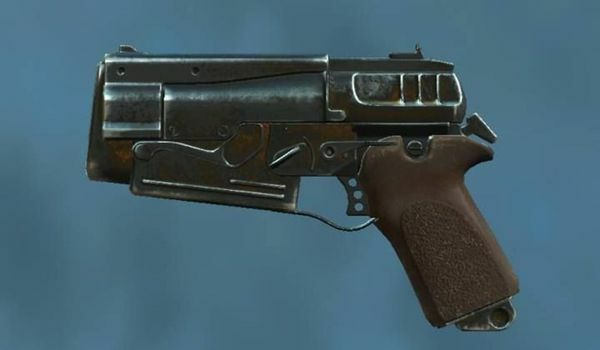 For this workshop, we'll be making a 10mm pistol replica from the game Fallout 4 using EVA foam. We'll be going through the process from fabrication to painting. This is a great class for learning how to get an unbelievably realistic look on foam cosplay props. All materials provided. Outside food and drinks are welcome and encouraged. Suggested ages: 18-118 years old. PLANET COMICON DISCOUNT!!! This class is sponsored by Planet Comicon, which means the class price has been discounted to $125/person (includes both days and all materials needed). Ann Gaffigan will present a talk that she will have given at ZendCon 2017 in October and that she will give at Nomad PHP in December! Hypothetically speaking, what if you wanted to change all of the lightbulbs in your house to use LED bulbs, but your current wiring didn't support LED bulbs? You would need to re-wire your house, which would take a long time. In the meantime, you wouldn't have any working electricity. Is there a better way? What if there was an adapter that could transition LED to work with old wiring if necessary, or if the wiring was new, just work as usual? That's a metaphor for how I figured out how to gradually upgrade a legacy (LAMP) code base to be compliant with PHP 7.0. Since PHP deprecated the MySQL extension functions as of PHP 5.5.0 and removed in 7.0, we needed to transition a LOT of code in a legacy system to use the modern MySQLi extension functions. In trying to figure out how to upgrade the code base without ceasing new development on the system, we decided to use an adapter database class to allow us to transition gradually. In this session, we'll explain how the adapter class works and also the rules we put in place to ensure there was an end to the transition tunnel. November 9: Hammerspace Community Workshop and Makerspace - Open House Night For New Visitors. Come tour the workshop & meet fellow makers. This is a joint meeting with KC Code Mentors. This just in: SEMPO Cities KC attendees will receive a 14-day trial, 10% off any plan and two attendees will win subscriptions from sponsor Lucky Orange! The Organic Search landscape is changing as quickly as it ever has. Whether it is "Mobile" or "Voice Search", how does today's SEO manage and maintain a successful approach to Organic Search marketing? Learn from the professionals of the SEO world as they provide insight on what's working, what's not and how to be a cutting-edge marketer or a part of a team that is going to get noticed. From tools and tactics to process and strategy, you don't want to miss out learning from these in-house and agency marketers. We are eager to announce the third annual SEMPO Cities Search conference. We thank SEMPO Cities Kansas City for their 20% discount code provided to the Kansas City Web Analytics & Marketing Metrics Group Members. Kansas City event, The KC Search Marketing Conference. Kansas City, alongside 11 cities nationwide, will host a SEMPO Cities event which as we experienced in the past few years is a great day of networking and learning all things in the world of Search Marketing. After enriching our minds all afternoon we will host a happy hour event to network and further discuss the topics of the day. November 8: Kansas City Identity & Access Management User Group - Save the date and don't miss out! We have an exciting event planned this November, you don't want to miss this one! In fact - you will want to share this with your industry peers! Not one but two presenters from Security Architect Partners. Want to learn more about Blockchain Identity? This is going to be GOOD!! For those of you who have attended before, you may have noticed we do a lot of networking at the start of the meeting. This time....we have to mix it up a bit. Networking at the end! What does this mean to you? Be there at 3PM!! It's going to worth it! Grab a drink, a delicious Lidia's meal and let's get down to industry learning from 2 experienced leaders in the industry. Doug Simmons brings more than 25 years of experience in IT security, risk management and identity and access management (IAM). He focuses on IT security, risk management and IAM. Dan Beckett is a member of Security Architects Partners' extended team with over 27 years of experience in IT, Privacy, Information Security and Identity Management. A big shout out to Radiant Logic for sponsoring this event. Finishing the app we started on the last session. If you did not come to the first one, I'll quickly review what we've done so far. • Working with UINavigationController and UITableViewController all from code. • UITableView Cell Register and Dequeue all from code. If you are a more advanced coders, please join us and help us dive deeper into Swift. We want to have meetups for all levels of expertise to strengthen the Swift community in the KCMO area. "So, who's gonna tell 'em?" The talk about "the talk" that nobody wants to talk about. The growing emphasis on "Individuals and Interactions" yields tremendous rewards, but not without risk. Teams who work together more increasingly find themselves in situations where they NEED to have sensitive and high risk conversations, but don't always know how to approach it. Everyone knows about some of the biggest challenges that face a team. They are also aware of the many ways the corrective conversation that can go awry. These conversations are often indefinitely delayed. Opportunities for growth are missed and resentment grows. Learn how to be the agent of change your team needs with techniques and practices to help you master the crucial conversations. That big "P" word: Production. That new piece of shiny code you just wrote with a hundred percent test coverage goes ka-put once it's deployed once deployed there. What broken, and why? Sometimes the errors are a little more subtle, lying and growing there until you reach the right conditions. Either way, when users experience problems, it's not good. Maybe we need to check our assumptions a bit and figure out how to lower the risk if things go sideways. We'll go over my experience in a highly regulated industry to apply the OODA loop, continuous delivery, ownership, and observability to embrace failure to lower risk of production incidents. Have you ever wanted to allow your users to be able to write scripts to execute actions within your application? Have you ever wondered how applications that do this accomplish it? Have you ever been sitting around with too much time on your hands and needed something interesting to think about? If so, then this talk is for you. During this talk we'll look at an app with a simple, easy to Grok API, and build up our own scripting language using the ANTLR4 Parser/Lexer generator, with which to drive it. All this, faster than you can say "The Dragon Book". An Advocates Guide: You Just Got Hired. Now What? Great! You landed a new job and are now on a team of developers. Who is bringing you up to speed? What are you doing in your down time? What questions do you ask? This talk aims to demystify those questions, decrease imposter syndrome and give less experienced developers a fair chance at becoming leaders. Juniors to tech leads will find this talk valuable. This session is to explain and show examples of how to design your APIs to make consuming them as easy and intuitive to the consumer as possible while also providing the functionality of a solid API. Talk on how and why to scale. Go over the 12-Factor app principles and discuss personal experience in utilizing these patterns to scale large systems at Workiva. Overview of scale evaluations and techniques to understand how well your system scales. In this talk we'll go over the fundamentals of ASP.NET Core 2 and what you need to know to get started and be productive. We'll discuss the latest changes and improvements made in ASP.NET Core 2 over the 1.x versions including the brand new Razor Pages. Companies like Google and Apple have made it really easy for any developer to create an app. The tools are great, the community support is amazing, and the tutorials are endless. This leads to a lot of amazing apps, but it also means the mobile market is crowded. There are a ton of apps out there and they do almost everything you can think of. How can you design and make something that will get noticed, and once you do, how can you maintain that momentum and build a product or a brand that is truly unique? I will cover the basics of getting started with your idea, including the importance of UI/UX as a base for your app and the tools for developing an Android app. Then I will go into the release process and how to convert views to installs and retain those users for the life of your app. Imagine that you have just started working on a large established legacy code base with little test support. Documentation doesn't exist and the development culture has been of a â€˜git er done' mentality, so there are reams of bugs, unused code, copy pasta, and so on. When you are tasked to make enhancements to this code, it seems like anything you do will likely cause it to break. In this session we will take a codebase of questionable quality and walk through a series of refactorings. I will lay out a consistent approach that you can apply to such code, and we will cover the common refactorings that are available in Eclipse, Intellij, and Visual Studio. If you bring your laptop along, I will be using Eclipse and code I find on Github, so you should be able to follow the presentation as we go through it. As an application adds more and more features, if you're not careful, it can quickly spiral into becoming the application no one on the team enjoys working on. This talk is structured as a series of lightning talks on various topics to help you improve the maintainability of your ASP.NET applications. We'll discuss libraries and best practices to help with folder structure, validation, ORM's, unit testing, code flow, DevOps, and more. By the end, you should be able to take at least one thing away that you can start implementing immediately when you get back to the office. Amazon Echo devices are affordable and are now in every home. Every windows machine comes with Cortana and Cortana even lives in entertainment systems. Would you like to build your own Cortana, Alexa, or Google home from scratch? We have built a device for under $100.00. We will show you how to design a 3D printable case. We will discuss our hardware selection for the brain of our very own Ai. We will show what we used for microphone and audio. Finally, we will show the code under the covers on selecting the Ai of choice and bringing the tube to life. Wrap it up and go out with a bang. Learn about code boot camp experience from two recent graduates of the first graduating Delta V class. Find out what we learned and our experience putting our lives on hold for 20 weeks. This session will introduce you to data visualization using ggplot2, an elegant and versatile plotting system for R. ggplot2 is based on a "grammar of graphics" for describing and building plots. Data is mapped to aesthetic attributes (color, shape, size, etc) of geometric objects (points, lines, bars, etc). Statistical transformations may be applied and the plot can be drawn on a specific coordinate system. A plot can be repeated for subsets of the data using facetting. Sophisticated graphics can be built up in layers, combining multiple data sets if desired. Themes can be used to control things like font size and background color. Much of the power of ggplot2 comes from the fact that it is based on coherent set of principles. Although this means there is a bit of a learning curve, ggplot2 is not going to get you 90% of the way to your desired graphic and leave you frustrated that there is no way to achieve what you really want. Basic knowledge of R will be assumed but not absolutely required. You'll come away with a basic understanding of how to create data visualizations using ggplot2. For about 15 years I have been developing software and in that time have settled on certain opinions and preferences based on my experiences. Confirmation bias and the bubble that I am in reinforce those opinions and preferences. In this talk audience participation is required. I will be presenting a list of my personal opinions and preferences and, for each one, will open up the floor for friendly debate. My hope is that I can learn something and at the same time impart some useful information to all who attend. Demos are a hugely valuable tool so that the team and the people around the team can see progress. Traditionally, more technical demos such as back-end services or support issues, either are not done or are so hard to follow they shouldn't be done. This presentation is filled with advice and tactics so that you can successfully demo 'everyone' and give your audience the knowledge they need to know what is actually going on. One of the benefits of agile development practices is responding quickly to feedback. We tend to focus on how to develop software in a way that gives us those capabilities, but it's time to start talking about how to actually get a useful feedback loop tied into the process. This will be a highly pragmatic discussion with real examples and demonstrations of how to create scripts, find participants, conduct measurable research and present findings. The lowly form input: it's been a part of HTML for as long as HTML has had a formal specification, but before HTML5, developers were hamstrung by its limited types and attributes. As the use of smartphones and their onscreen keyboards has flourished, however, inputs have taken on a new and incredibly important role - but they're also riddled with browser and device inconsistencies. Learn how input types and patterns can give your users a better onscreen keyboard experience, and how to abuse these features to meet the needs of today (if you must). People tend to classify one another by gender, race, or other physical characteristics and instinctively react based on stereotypes and cultural norms. These automatic prejudices (often called unconscious bias) contribute to the disproportionate success of white men in STEM when compared to equally qualified women or minorities. The key difference between unconscious bias and intentional discrimination is that the individuals that participate in it are often motivated to end these behaviors when they're brought to their attention. This discussion will cover common patterns of unconscious bias that occur in the workplace and offer concrete actions to intervene as an employee, a manager, or an organization. 10 Years ago Steve Souders of Yahoo published the book High Performance Websites that described in depth how browser engines request assets and render html, and how to tune your pages for speed. Around the time the book was released, Yahoo also released YSlow, a tool which leveraged the highlights from the book to give a web page a grade for rendering speed and to help with tuning. Do the principles from 2007 still apply today? For this session a younger, hipper colleague of mine (Ben Kallaus, another developer at Telligen) will debate me as we cover the tuning recommendations made by the book and discuss whether they are still relevant. We will also spend part of this session reviewing developer tools built into Chrome and will describe how we use them as part of everyday development. Learn how powerful AWS Step Functions can be to influence your next project. Leveraging several internal tools at Amazon, Steps provides a simple interface for creating very complex state machines, letting you focus on the code and less on its supporting infrastructure. If you want to know what Blockchain is, how it relates to crypto-currencies like Bitcoin and why people compare it to early days of the Internet then this session is for you. I will give an overview and practical ways to get started based on my own experience and share other resources if you want to dive deeper. This session will introduce you to R, a popular language and software environment for data analysis and visualization. We will cover some of the basics of the R language, but we will focus on examples of the kinds of things that R excels at, like data manipulation, statistical computing, and data visualization. We'll also introduce the R ecosystem, including R packages and RStudio. We'll see examples of how you can easily create documents containing code and graphics using tools like R Markdown, or create and publish interactive data-driven web applications using Shiny. No prior knowledge of R is required. The emphasis will be on breadth rather than depth. You'll come away with a basic understanding of what R is all about and suggestions for how to learn more. Know about Federated Identity: SSO. OAuth or Open connect. Learn to differentiate Single Sign On. OAuth, Open connect and explore the implementation these wide standards in web solutions. Earlier this year, Google announced that Jetbrain's Kotlin (https://kotlinlang.org/) programming language was becoming a first class citizen for Android development. Being a much more modern programming language, Kotlin support marks a turning point for Android development, similar to the introduction of Swift for iOS development. This talk will cover the basics of the language and what makes it unique from Java, then I will get into setting up and using Kotlin in your Android projects as well as converting existing code to the new language. This is an introductory talk on both the basics of Kotlin, as well as Android development and setting up an app. The React ecosystem can be overwhelming to learn all at once, but React by itself can be much more manageable. In this talk, we will explore ways to learn React and JSX in an isolated way so that learning is not distracted by other tools like Babel, Webpack, Redux, or even how to load data from the back-end. 5-10 minute talks supplied by you! Come prepared or be spontaneous! Stop logging for the humans, log for computers. When debugging issues or looking for anomalies, finding context and metadata in human readable logs is never easy. In this talk, I will show how logging for computers from your applications and servers will make your life easier and get you quicker to finding the things you are looking for. Learn more about how to select and make the most of opportunities to continue your own education. The speaker will share what he has learned through his participation in courses offered by Coursera, Udacity, Duolingo, and other vendors. The presentation will include tips for effective study and a review of the tremendous increase in the quality and quantity of online courses during the last five years. Join us for open discussion based on topics you suggest. Reinforcement Learning: Welcome to the party! In this session I will talk through reinforcement learning. I will start with a solution to an OpenAI gym by using DQN (Deep Q Network) with Keras and Tensorflow. Visit with our sponsors to learn about their services and opportunities. Working remotely can sound great. You have to create the right environment and work effectively with your teammates. Don't think it is just working in your PJs every day. We will discuss how to work remotely and create best practices to ensure things work out for you and your teammates. Surviving and thriving in a technology career can be quite difficult. First you need to focus on your technical chops. Then you have to figure out how to work with your team members and manage your boss. We will cover the steps it takes to make a tech career successful. When I first saw the infamous Deloitte Agile Landscape diagram, I wondered how did agile get so complicated. The second thought was a question: 'how can I inspect those techniques and practices and choose the right ones for my team?'. In this session, I’ll talk about how empirical data (which I’m calling agile numbers) can serve as signposts on our journey to reach the goal of delivering customer value faster with maximum reliability and minimum issues. I’ll show how agile numbers can help us determine if a practice is worth the investment and whether it will improve our team’s performance. I will also share examples of agile numbers that can assist you in your agile journey. Those numbers are pulled from different sources like scientific studies, research from Google, and the 2017 State of DevOps Report. Imagine working from home full-time. Your job choices are not limited geographically. You have a nice quiet workspace in your comfortable home with limited distractions. Lunch break in your easy chair. What's a dress code? You don't have to go outside in the morning during a frigid Iowa winter. Sounds perfect. Now imagine this actually happening to you and nothing goes to plan. How do you stay motivated? How do you deal with communication breakdowns? The feelings of isolation? Of feeling like a second rate employee of the company? In this presentation, Mike will review the tips and techniques he has learned over the past several years while being a full-time remote developer. This session is geared both towards developers and managers of remote development teams. When is the feature done done? How does a development team ensure that the feature they are working is done? Development teams throughout time have tackled this task. Organizational dynamics makes this task different per team. Some common techniques emerge though to ensure that a feature gets done as quickly and accurately as possible. I will be facilitating an open discussion on how the above question is answered while also giving insights from my time on development teams. Topics discussed will include Git, CICD, Client Interaction, etc... Be prepared to participate. Discuss what it means to be an Architect and how to work through technical decisions in the context of building out Workiva's microservice architecture. I hope to share my personal experience and have a candid conversation about the challenges of working in technical management and share techniques for helping groups work through conflict to the point it is resolved. NOTE: This is our joint meet up with Data Science KC. If you'd like to attend, RSVP over at: https://www.meetup.com/Data-Science-KC/events/243681703/. The DS KC RSVP list is the OFFICIAL list of who is going. We start with petabytes of noisy, conflicting, incomplete and complicated healthcare data, and aim for meaningful features for machine learning and other analysis. This talk looks at Data Engineering techniques to first make sense of complex data, how we have grown cloud-based architecture to support it, and how we quickly adapt that system for new needs. Ultimately this lands in a scalable user experience powered by Apache Spark, along with a set of feature engineering patterns and a set domain-specific helper functions. Many of us data science and business analytics practitioners perform research and analysis for decision makers on a regular basis. The deliverable of such analysis often results in a Power Point presentation, and/or a model that needs to be productionalized. The code used to produce the analysis also needs to be considered a deliverable. Many of us perform analysis without reproducibility in mind. With the increasing democratization of data, it is becoming more and more important for people that may not have scientific training to be able to create analysis that can be picked up by somebody else who can then reproduce your results. That, and creating reproducible research is just solid science. We are going to spend an evening walking though the various tools available to create reproducible research on Big Data. You will get introduced to the Tidyverse of R packages and how to use them. We will discuss the ins and outs of various notebook technologies like Jupyter, and Zeppelin. You will have an opportunity to learn how to get up and running with R and Spark and the various options you have to learn on real clusters instead of just your local environment. There also be a quick introduction to source control and the various options you have around using Git. The theme of the evening will be "getting started". We will go over various training resources and show you the optimal path to go from zero to master. Some commentary will be provided around the current state of the job market and intel from the front lines of the data science language wars. This is a large topic and the evening will be fairly dynamic and responsive to the needs of the audience. Bob Wakefield has spent the better part of 16 years building data systems for many organizations across various industries. He has been running Hadoop in a lab environment for 3 years. He is the principal of Mass Street Analytics, LLC a boutique data consultancy. Mass Street is a Hortonworks Consultant Partner and Confluent Partner. In his spare time, he likes to work on an equity investment application that combines various sources of information to automatically arrive at investing decisions. When he is not doing that, you'll find him flying his A-10 simulator.